So the good news about this weekend, apart from the fact that I took today and tomorrow off, giving me a four day weekend, is that the youngster decided that he had had enough of this crawling or standing lark so so put them together in a semblance of what can only be described as 'walking' (though waddling then falling over would be slightly more accurate, so gross misuse of the word 'only' there). His first attempt at this seems to have been on Friday evening - as I was getting ready to give him a bath he was standing by, and holding on to, the fridge. He then let go but instead of sitting down, as is normal, he took three tottering steps to the door, whence he held on once more. I was watching this in the bathroom mirror (the angles are such that one can see into the kitchen, this usually entails a game of peekaboo with the youngster) and thought it was impressive but something he had already done, but on telling the Guru she was surprised as she had not yet seen it (a rare occurence when dad sees something for the first time!). Obviously he realised that as a big boy (well, it was 1 day before his 13 month 'birthday'), he had better get this walking thing sorted, and so he has. But for some strange reason he has regressed a little in that whilst over the weekend he has tried, and achieved, quite a bit of tottering, the new best game is to use his stroller/trolley thing to practise with, supported by the bar rather that 'free' walking. Anyway that will come, I am sure, but for now it is a big well done for the walking boy! So on Saturday we went off for adventures in Kinshicho. Now you may think there is little adventure to be had in Kinshicho, and in the main you would be right, but we found a little bit of it that was not only adventuresome but also educational and informative as well. Well slightly adventuresome, at least. OK, I’m padding now. Ever since the little ‘un was born the Guru, in her dedicated mother sort of way, had been looking for a kind of first aid for little kids type class we could go to together as a family. 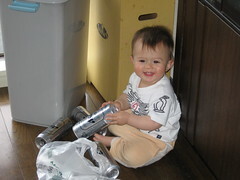 Now I know what you are thinking, how can a one year-old kid do first aid? But no this was a class for the parents of kids who have a feeling that their kid is going to injure themselves in the not too distant future (i.e. every parent on the planet, I reckon). But it might surprise you to know that these kinds of classes are pretty few and far between and hence we had to go all the way to Kinshicho to find one – not that Kinshicho is really that far away, but it isn’t just around the corner and took a good hour to get to via various train lines. We were meant to leave around 1130ish but sitting arounf at 930 we found we had little to do except tidy the house and as such the cry of ‘why don’t we go earlier?’ was raised and accepted with, it has to be said, a lucky degree of foresight. 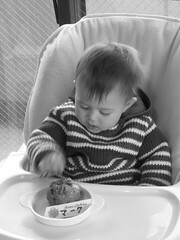 The other reason for going was to visit a brand spanking new Baby Zarus. Now I am sure you can looking at it written there, quickly work out that is meant, in fact, to be Babies ‘R’ Us, but when the Guru told me this was where she was intending to go I must admit that it took me a good 5 minutes to work out what she talking about (try saying it quickly with a Japanese accent and you’ll see what I mean). So we arrived in Kinshicho early and headed off in search of the aforementioned Baby Zarus, which had only be open for about a week. Whilst we were in the UK for crimbo we went to a UK version (or it might have been a Toy Zarus, I can’t quite remember) and it was, to be quite frank, somewhat on the dingy side, a bit tatty, understaffed and well, a bit dishevelled – basically, I suppose, like the UK. But this one was all gleaming and new and shiny and, as with most shops in Japan, heavily staffed. However what we also found out was that it was pretty over-priced and Akachan Honpo (to whom we take off our hats) was just as good and a darned sight cheaper (though I will admit that Baby Zarus has Baby Einstein DVDs, of which I will return to purchase as I haven’t seen them anywhere else in Japan). Then it was onto the fire station and their attached ‘Disaster Prevention Centre’, or somesuch grandiose name (hint – to prevent disasters in Japan, move away from seismic fault lines and volcanoes (and yes, I realise that would mean moving out of the country all together)). So we arrived and registered and then had a few minutes to poke around and see what was what. It is quite a good place this and there were lots of kids playing with various touch screen TV gizmos that told them how to put out fires or save their elderly relatives from mochi-death at new year and, as luck would have it, you could choose English language variations as well. Got to worth a crack, thought I, and selected a machine for phoning the fire and/or ambulance service. At the start this was quite straight forward as you selected what sort f thing you wanted to report, I chose an accident in the home, then you picked up a real phone and placed the imaginary call. But here it got a little strange at the voice at the other end of the phone said everything in Japanese and the TV screen translated it into English and, as it was all a recording, it didn’t matter what you said into the phone as the video played through anyway. So if I do ever have to phone in an accident in our home I hope a bloke on a TV screen suddenly appears as otherwise person at the emergency end of the phone isn’t going to understand too much of what I’m saying. Hmm. So onto the first aid bit. Now having been in various boys organisations as a spotty youth I have a pretty good grasp of first aid, rusty though it may be, and so I was quite looking forward to this to see if it was what I remembered and to see if things were the same in Japan as the UK. But in the end there wasn’t actually that much first aid going on, more it was what to do in one of two situations: 1 what to do if your baby is choking on something and; 2 what to do if s/he has stopped breathing (and to be fair the first one is something that is invariably going to happen, judging by the fact that anything that can be picked up goes into the mouth almost straight away). Places on these sessions are hard to come by and when we saw the other attendees it was easy to see why. The session had been block booked by the Kinshicho women’s volunteer baby task force group, or something, about 15 of whom took over one end of the practice dojo, there were only two couples with kids in there, of which we were one. Not sure what the task force actually do, could be cleaning up the dodgy, gang infested streets of Kinshicho for all I know, but some of them looked pretty mean to me (and others pretty dopey so maybe not). The leader of the session was not some strapping fire or paramedic type person but a little old lady in a uniform whose skirt made getting up and down from mats on the floor quite an operation. She was also one of those types who would not stop talking or interrupting, which can make instruction excruciating at times. First the choking. This was practiced with a plastic baby who had swallowed a small foam pellet just the right size to get trapped in a hole in her mouth. The instruction was simple, put the baby face down on your thigh as you are kneeling and then give it one almighty thump on the small of the back with the heel of your hand. The instructor women said hard, but I am sure that the way I was thumping the back (and failing to remove the pellet) I would have broken the baby’s spine, but there you go. She said it was fine and in the end the pellet did come out, but only after enough force had been applied to dislodge the lungs, appendix and spleen, I suspect. The stopped breathing bit was more complex as you had to check various things as you went along, as you would expect, and ended with trying to give artificial respiration to another small plastic baby. This was actually quite interesting and we all got quite into this – the thing to remember is when you are trying to blow air into the baby’s lungs you should only do it a little bit otherwise you might blow too much air in the lungs might explode – not a nice way to go! Anyway the point about this was the instructor showed everyone how to do it, then went through it again, and again and again. Then we got to have a go with the dolls and she talked us through it, stopping at each action to explain, again, what and why. And then we did it again to her accompaniment. At no time did she let everyone just have a go themselves, all the time she was clapping and counting and stopping and explaining. Even the Guru got frustrated with the instructor so in the end we just did it ourselves and got the hang of it without interference, which we felt was more important as it is unlikely the instructor will be in our apartment to help count out 10 seconds if something does happen to the little ‘un. And that was about it, so now we fell jolly prepared for if something does happen – well, a little bit more prepared than we did before. They also had one of the big earthquake simulators there, which we really wanted to go on, but it was all part of a tour that we had missed the start of so wouldn’t let us in, more’s the pity. But by the end of the day the plan to go early proved the right decision as just as we got home a massive rain storm hit, flash flooding in the streets stylee, and we just missed it. Nice. It isn’t really called children’s day, you know, that, apparently, is quite an un-Japanese sop to PC-ness and inclusion. It’s actually Boy’s Day and most people still refer to it as this, because, basically, boys are allowed to have more fun in Japan than girls so they need a day especially for them, or something like that. That day is May 5th (also, by coincidence, my mother’s birthday – happy birthday mum) and is a national holiday (there is, I think, also a girl’s day, but of course it is a normal day rather than a holiday for obvious reasons (like wives/mothers aren’t allowed a day off so why should girls get one? (The views expressed here are in no way representative of the liberal, new manliness of the author, not only do I eat quiche but I can make a pretty darned fine one too))). 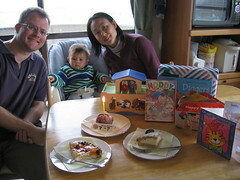 Anyway it was ‘Children’s’ Day on Friday last week and this was also the first proper one for the youngster, as last year he would only have been about two weeks old, and as such there are strange and wonderful traditions that need to be upheld, although actually the strange tradition was for something else, but we will come to that in time. So on the 5th the Japanese grandparentals and uncle came over to pay their respects to the youngster and generally for lunch and a beer or two. There are two things you have to do for boys on ‘Children’s’ day, the first is to buy some Shobu. Shobu is, as far as I can tell, a worthless type of grass, or possibly weed. You can’t eat it, it doesn’t look particularly appealing and it doesn’t have an arresting fragrance. In fact it is the sort of thing that farmers, a few centuries ago, looked at and decided ‘well, we can’t actually do anything with this stuff, but it seems rampant round the rice fields, so let’s invent a ceremony for it, otherwise we’ll have to cut all the blasted stuff down and that will take forever”. Or something. So, what you have to do is hang some of this stuff around you front door on ‘Children’s’ day in honour and homage of any boys in your house. Fair enough, I guess, bit like hanging mistletoe at Christmas, possibly. Then when grandparentals come in they can nod sagely and murmur “well done on the shobu front. No, I don’t know what it’s for either”. But then, at the end of the day, when you shobu is beginning to wilt, do you throw the stuff away? Oh no, much better than that, you have a bath with it. As I said before it seems to have no smell, or healing properties, it is grass after all, but tradition has it that you pop a couple of plants in your ofuro before your evening soak. There were even pictures on TV of local sento bath houses with baths full of the stuff. And to be fair the youngster kind of enjoyed it – well, kind of enjoyed slapping it in my face as I gave him a bath, which is pretty much the same thing, but I’m not entirely sure that was the point. 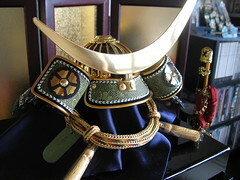 The second thing you must do for boys on ‘Children’s’ day is to buy them some imitation ceremonial samurai armour, so they grow up to be big strong warriors following the Bushido code (and to keep ceremonial armour manufacturers in business), though no one seems to actually wear samurai armour on a daily basis any more, so I think things may have moved on a little. Anyway as you can see from the photos below, we have bought the youngster some rather fine blue, black and gold armour (well, helmet) that has been on display for a week or two now. Unfortunately you can’t actually put the armour on, or even draw the little sword that comes with it, as, I assume, it might be dangerous. But still, it’s pretty cool stuff to have. 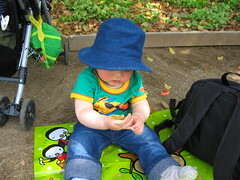 Girls have to make do with a bunch of Hina dolls on their day – as I said, more fun to be a boy. The other thing we got to do was an old, old Saitama tradition that the Guru heard about from her pregnant pals and which thought sounded like jolly good fun. The tradtion goes something like this. After a baby (boy or girl this time) has reached the ripe old age of one they take part in a ceremony called Ishoumochi where the parents go to a department store and buy a bloody great lump of mochi, weighing in at about 1.5 kilos (or about 3lbs in old money). Now mochi, if you remember, is pounded rice that forms kind of stringy mozzarella type stuff that Japanese eat lots of at new year and by which old folk are always dying as it gets all stringy in their throats and they suffocate. Anyway it is solid stuff and, again as you can see from the photo below, the lump is quite big and has kanji painted on it. The idea is to show how big and strong a baby is by tying this lump of mochi to them and then getting them to walk around with it. Now this is jolly good fun, except, of course, for the little kid that has got to do it. 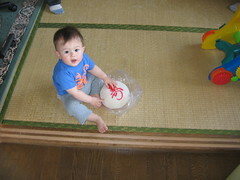 The youngster did not take kindly to having 1.5kgs of mochi strapped to his back at all (I can’t imagine why). 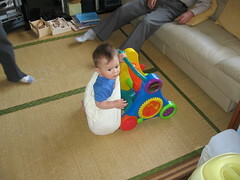 Apart from the fact that he can’t walk yet and his standing is of the tentative kind as well. But he did manage to crawl a bit, dragging the mochi behind him, which we all agreed was pretty good going and so have him a rousing hurrah. Apparently if the kid can’t do it with one lump of mochi it is because they are over balanced, so the accepted remedy is to strap two lumps to them, one front and one behind (just the 3kgs then) so as to counter balance the forces on them. Personally I’m all for weird and wonderful traditions, especially ones I can’t understand and can humiliate my offspring with in the future, so I had another beer and watched the show. So a busy last few days really. As you may have noticed in a comment from golf-playing-brother (and you might even have guessed anyway) it was the youngster’s birthday last week, on Thursday 27th to precise, when he attained the ripe old age of one (saying it to myself now, the grammar seems wrong if you say ‘he is one year one’ or is you say ‘he is one years old’, but surely one of them must be correct and it doesn’t seem right to say ‘he is a year old’, though of course he is, but I’m rambling now). To celebrate this most auspicious of occasions we dined at Maxim de Paris and then spent the night clubbing at Womb, Yellow and the Liquid room, as these are his favourite haunts. Not really, but he may do one day. What we did do is have a small party with meself, the Guru and the man of the moment, where we had cakes and presents and things, which is at it should be. What it shouldn’t really be, but was, was two days after the day itself, on Saturday afternoon, mainly as we couldn’t really get ourselves organised for Thursday and, of course, about 30 minutes after I got home from work he went to bed, which would have made any party a curiously short lived affair. Anyway he didn’t seem to mind too much about having his party on Saturday afternoon and seeing as it takes a kid over a year to gain a sense of time (apparently), I don’t think he noticed anyway. But he did like his cake, with a candle in, of course. He doesn’t get to each much cake as these things are strictly rationed by his dietician (the Guru), so when he got to eat most of a fruit muffin thing he was most happy indeed, put a big smile on his face at least, though that could have been wind, who knows (oh, and he had his cake and he ate it, putting that myth to bed, I hope). Anyway, he are a couple of photos of the day. Monday was 1st May, if you hadn’t noticed, and that means demonstrations by the Japanese Socialist and/or Communist Worker’s Party in the park where not three weeks ago everyone was getting drunk looking at cherry blossoms. Funny old world, eh? Anyway we walked past this demonstration on the way to a much better park that contained no political rallies of any sort. But back to the action. 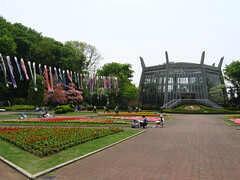 Near Kawaguchi there is a place called the Green Centre – the green centre of what, they don’t tell you, but it is close to Green City which is a shopping centre I wrote about once as it contains our nearest branch of Japanese Mothercare. What the Green Centre is, though, is a park that has all the things you want from a park, such as grass, trees, flowers, ponds, waterfalls and lots and lots of little kids running about. Also on Monday the mercury touched 28oc and so a trip to the park seemed a fine idea indeed. The park was, well parky, as you can see from a couple of photos below. The long carp streamers are there because we are rapidly approaching Boys Day on May 5th (more of which next week), and these are traditional things to hang outside to say ‘yes, my son is 14 foot trout’, or something. At the park we strolled about in a promenade style fashion, taking in the air and watching what seemed like the entire population of Kawaguchi’s kindergarten system running about enjoying themselves (I’m sure I never went to places like this when I was a kid – I got farming museums, as far as I can remember). Naturally we took a picnic with us. Well, when I say we took what I mean is that the Guru and I took food to eat whilst the young ‘un decided to pick something up at the park. What he didn’t tell us was that he intended to pick up 4 handfuls of mud, a couple of leaves and a stick. I’m glad to say that he enjoyed these very much, though the same can’t be said for the Guru, who was nonplussed to say the least.